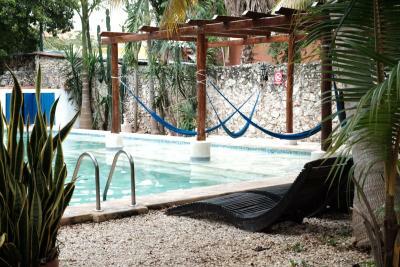 Lock in a great price for Nomadas Hostel – rated 8.7 by recent guests! Nice atmosphere. Still a quiet place despite a huge common area with pool. Free cooking, yoga, dance, and other classes. There's a pool. Decently friendly staff. Free breakfast. Generally a good value for the money we paid. 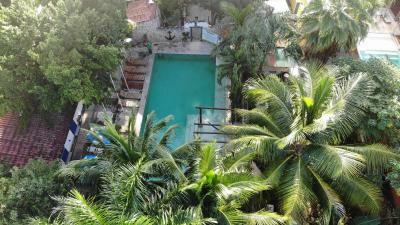 The pool and the trees around adds to the ambience and what gives the character to the hostel. The location is very good. Location, hammocks, breakfast, activities, and helpful staff. 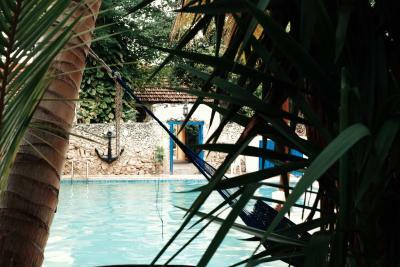 Good communal facilities - plenty of hammocks, swimming pool in the yard, good breakfast and extremely helpful staff. I have stayed at this hostel many times since 2006, often for prolonged periods (1-3 weeks). The staff is nice and reliable and a lot of them have been the same staff for years which gives a good impression. 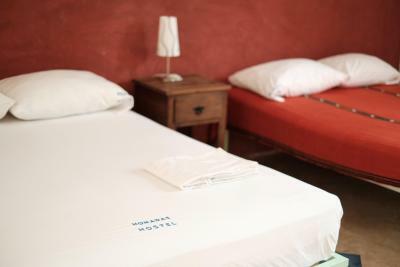 I have always liked this hostel because it was decisively not a party hostel (and there is always enough of those around) and you can stay for an extra couple of days just to relax. I found it a bit too noisy this time around (you can barely hear yourself think when the evening salsa class is on, and evening quiet hours have now been reduced) but overall still good. It is noticeably more crowded since they built the additional accommodation buildings behind the swimming pool, but it works well. Just hope they don't expand more! The place is extremely clean and well looked after (even during rainy season you will not once find a single mosquito in dorms/rooms). breakfast is consistently good and varied. One of our best sellers in Mérida! 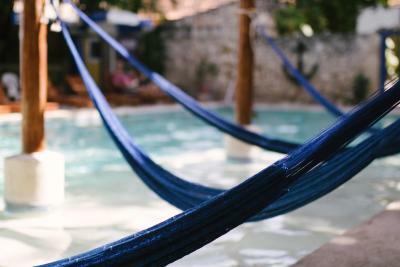 Located in a colonial house just 5 blocks from Mérida’s main square, Nomadas Hostel features an outdoor swimming pool with hammocks. 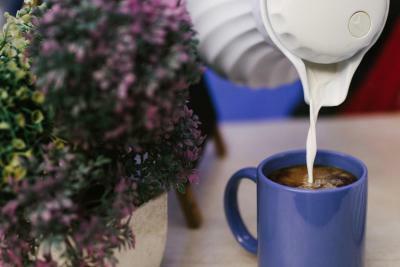 It offers a free American breakfast and a 24-hour reception desk. 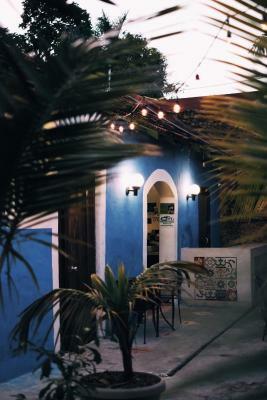 Nomadas Hostel includes a communal kitchen, lounge and dining area. There is also a garden-terrace where guests can relax. Free Wi-Fi is available in public areas. Parking is available. Staff are happy to provide information about the city, nearby sites and activities in the surrounding area. 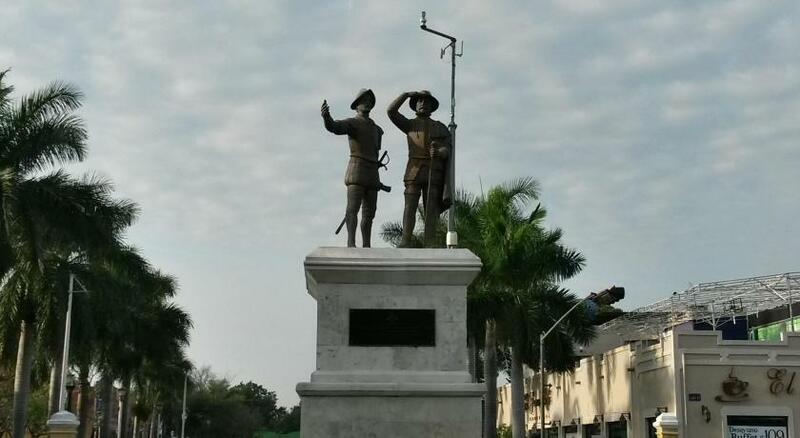 Mérida’s main bus terminal is 1.1 mi away and Manuel Crescencio Rejón International Airport is a 15-minute drive away. 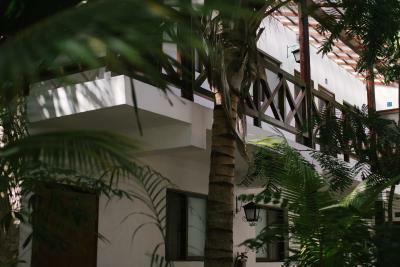 뀐 Located in the real heart of Mérida, this property has an excellent location score of 9.1! 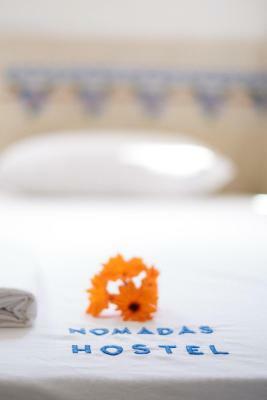 When would you like to stay at Nomadas Hostel? 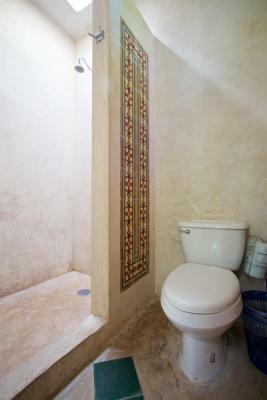 This room features a fan and offers access to a shared bathroom. One bed in a 3 bunk bed female dormitory room with a fan and an outside shower and bathroom. Please note that children under 16 years old cannot be accommodated in dormitory rooms. One bed in a 8-bed mixed dormitory room with a fan and an private bathroom. This bed in dormitory with 3 bunk beds and in room bathroom. This room features two double beds, private bathroom and garden views. This room has 1 bunk bed, a double bed and a single bed. There is a private bathroom. 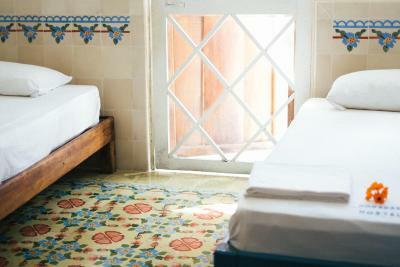 This room has a twin and a double bed and features shared bathroom outside the room. 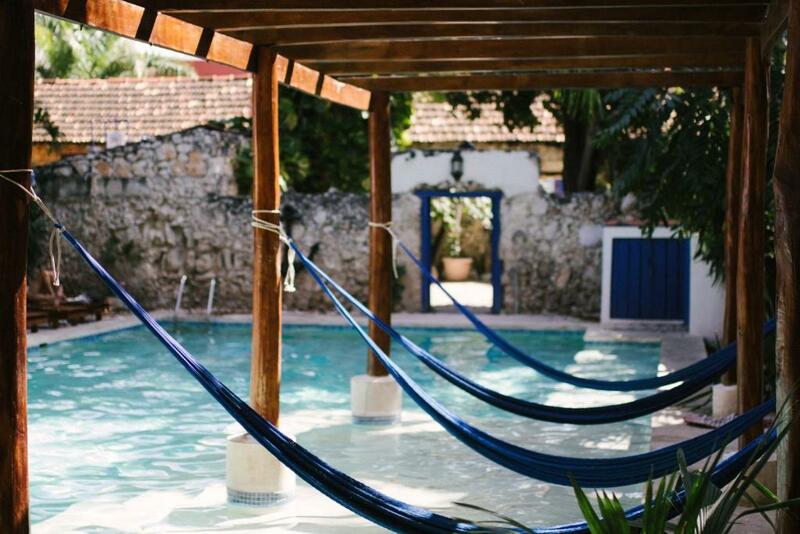 House Rules Nomadas Hostel takes special requests – add in the next step! One child under 12 years is charged MXN 150 per night when using existing beds. Nomadas Hostel accepts these cards and reserves the right to temporarily hold an amount prior to arrival. Not Presenting any one of this ID the reservation can be cancel for security reasons. A deposit of 100 MXN will be required upon receiving the keys to the room and locker, it will be refunded when they are returned. Please note that guests must wear headphones when listening to music, since no loud music is allowed. Please note that for security reasons guests must wear the hostel´s wristband as identification at all times. Please note that the Hostel will turn off the lights at midnight and will not allow any alcoholic drinks within the premises except for wine and beer. A Credit Card must be presented upon Check in. Please note that all special requests are subject to availability and additional cahrges may apply. 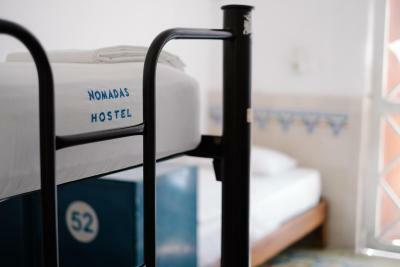 Please inform Nomadas Hostel of your expected arrival time in advance. You can use the Special Requests box when booking, or contact the property directly using the contact details in your confirmation. The kitchen area is not the cleanest. The hostel is in a great location. It’s also very beautiful. The pool area is awesome. Everyone is really friendly and it’s easy to get to know people. The hostel has different activities going on each night. I have already been to a lot of Hostels...but none like this one! Very clean (the bathrooms are cleaned several times a day) , good location, friendly and helpful staff. There are a lot of nice offers like yoga, salsa, cooking or a musician coming by. The pool is great to cool down after a hot day out. I would definetly recommend this small piece of heaven! When turning on the airco, giant ants fell out. Sometimes you wake up in the middle of the night because of the horn blowing of a departing train. Nice pool, pretty room, hostel vibe but also a good place for couples that are travelling. Here, you'll meet the greatest people. 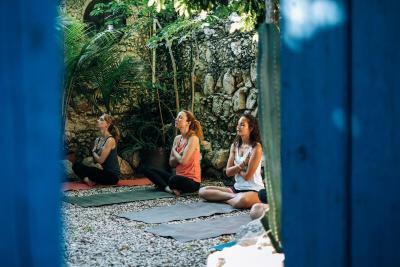 They offer yoga, salsa and cooking classes, all worth taking. We took the cooking class and Daniel the chef was a blast. Also, very close to nice bars and good places to dance. Both dorms and private rooms are really nice. We would have loved to extend our stay, but we had a flight to catch. Nothing bad to say about Nomadas. Nice staff. Activities offered and good wifi. Great location, good facilities, friendly staff, great cost! Internet works good but signal is only outside the room. At 9pm starts air conditioning all night long and it becomes really cold. Very good located. Nice ambient with large spaces. Many showers and toilets also outside the dormitory. Lockers with key included. Whe it got x-tra hot the doors only had screen on them, so though the walls kept the room cool, the screen doors didnt prevent the heat from invading a cool space, so only part of the room maintained a cool aspect to it. You would have to be near the air conditioner to sleep. Where a door of somekind would benefit the airconditioner from having to compete with the outside heat. The A/C was also turned on to late/10pm o the space was hot to sleep in if say you wanted to be in bed by 9. This was my only concern. 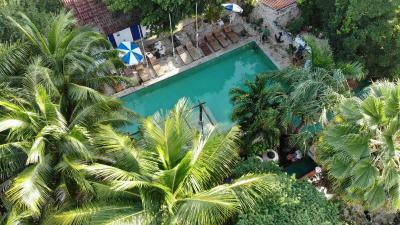 The milieu was fabulous, the pool, courtyards, extra activities; yoga/am, salsa lessons/pm, make for an addition to the regular lodging space. It also attracts travellers rather than just tourists who are interested in exchange and not just in staring into a cell phone - who enjoy sharing where interesting details are in the area as well as how to be prepared to swim at a cenote at Dzibilautun, which made my day there as it was so hot a swim before and after made all the difference to a very emjoyable day. E v e r y t h i n g. This place is amazing, definitely worthy the price. The pool, breakfast, location. Really recommend. Unfortunately the hostel did not really encourage people to meet & talk to each other - if they sold beer at night & if the common eating area was more comfy it would be a perfect hostel. Private room did not have A/C (could not request it either), just a fan, which isn't terrific considering how hot it can get in Merida. Also, no hairdryer available. Great atmosphere for meeting people as a solo traveller. Pool was a cool area. Good, knowledgeable staff. Cooking class was absolutely terrific. Great location. Decent breakfast. was like staying with family...so comfortable and welcoming.